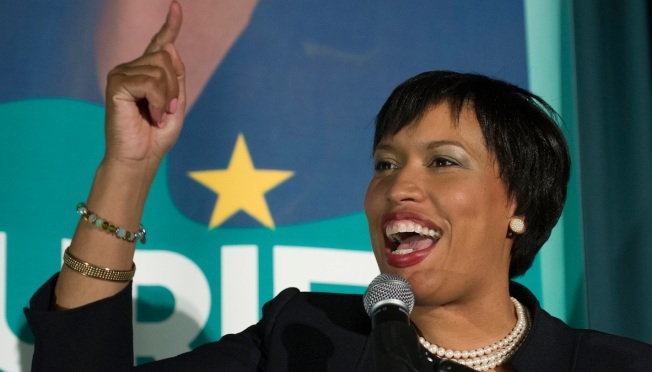 Muriel Bowser won the Democratic nomination for D.C. mayor Tuesday, defeating an incumbent wounded by a fundraising scandal. The race was shortened by weather and roiled by an investigation into the fundraising of incumbent Mayor Vincent Gray's 2010 campaign. Turnout Tuesday in many of the city's 143 precincts was light but steady. News4's Tom Sherwood and Mark Segraves report from Muriel Bowser and Mayor Vincent Gray's election night parties. 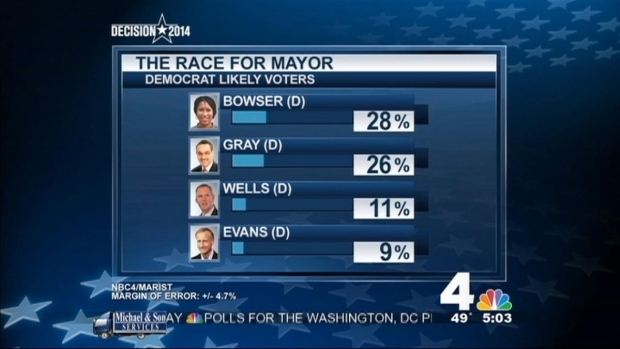 With 127 of the city's 143 precincts reporting, Bowser had claimed almost 44 percent of the vote to Gray's 33 percent. Just before midnight in front of a subdued crowd, Gray conceded the election. 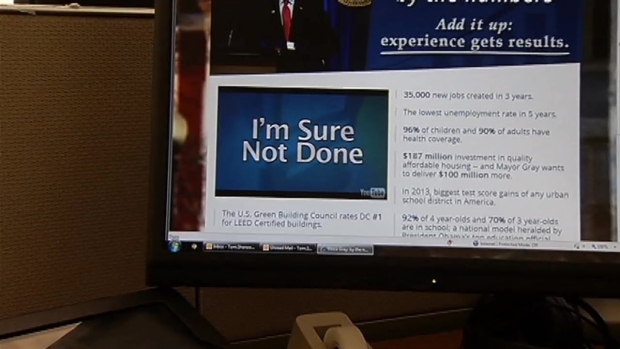 "The amount of work we've done over the past three and a-half years has been nothing short of phenomenal," Gray said. Gray pointed to the unusually cold winter as hampering his campaign. Voters in DC went to the polls Tuesday for the 2014 primary election. Turnout througout the day was light and steady. News4's Tom Sherwood shows us the scene from the polling stations. "One thing I have to say, I hope the city will change the date of the primary," Gray said. "This is really poor... having to run a campaign in winter. Trying to knock on doors in February is hard, it's complex and it's cold." He still has nine more months in office as a lame-duck mayor. Voters in the nation's capital decide Tuesday whether Mayor Vincent Gray should get a second term amid a federal investigation of his 2010 campaign. In her victory speech, Bowser pledged to unite the party amid thunderous applause of her supporters. "We know we need a fresh start," Bowser told a fired up crowd. "[Democrats] will unite. The Democrats of the nation's capital have always elected a Democratic mayor, a Democratic mayor, and in big numbers. And we're going to do it again in November... I accept your nomination!" Bowser will face David Catania, a former Republican and now an Independent, in November's election. D.C. voters are heading to the polls Tuesday to decide whether Mayor Vincent Gray should get a second term amid a federal investigation of his 2010 campaign. Though eight candidates ran in the Democratic mayoral primary, the race quickly narrowed to two leading candidates: Gray and Bowser. Gray's support through the campaign stayed steady, but enthusiastic, even after federal prosecutors said he knew his campaign took funds raised illegally by D.C. businessman Jeffrey Thompson. Gray, 71, has emphatically denied that he did anything wrong. Voters in the District of Columbia will head to the polls Tuesday to choose a Democratic candidate for mayor. Several D.C. Council seats are also up for grabs. But support for Bowser, who has been advertising herself as a "fresh face" in local D.C. politics, spiked after Thompson was charged, and the last NBC4/Marist poll, one week before Election Day, showed the two in a statistical tie. In other races, Brianne Nadeau defeated incumbent Jim Graham as the Democratic nominee in Ward 1 in District Council. Kenyan McDuffie easily won the Ward 5 nomination, Anita Bonds was re-elected as a nominee for council at large and Phil Mendelson won the nomination for council chair. In Ward 6, Charles Allen defeated Darrel Thompson. Bowser was the first mayoral candidate to cast her vote Tuesday, arriving at LaSalle Elementary School just after polls opened Tuesday morning. Gray stopped by the northeast Washington school around the same time. He talked with voters and danced with volunteers. Volunteers for his campaign stood outside the school chanting, "Four more years," while Bowser's camp yelled, "New mayor, fresh start." Wearing a campaign shirt rolled halfway up his torso, Gray voted a few hours later at his polling location in Ward 7. The shirt was rolled up because candidates can't show campaign logos inside polling locations. 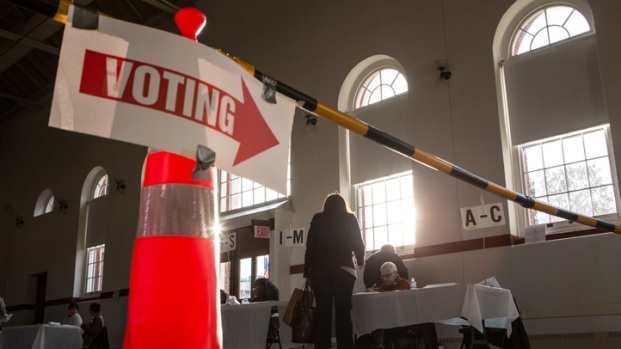 Other candidates ouvoting early Tuesday included Ward 2 Council member Jack Evans and Ward 6 Council member Tommy Wells, who were both trailing in the polls and looking for an upset. Restaurant owner and newcomer candidate Andy Shallal voted as his campaign workers worked the polls. Also on the ballot were candidates Vincent Orange, Reta Jo Lewis and Carlos Allen. Aggie Wellington, 64, who has lived in the city for close to 40 years, said she is fairly happy with the direction of the city and voted for Gray. "To be honest, I don't have any complaints,'' Wellington said at a polling station at William B. Powell Elementary School. Wellington, an administrative assistant, said she wavered between candidates and would like to see a female mayor, but in the end voted for Gray. "I don't mind giving him another chance,'' she said. Zach Teutsch, 30, cast his vote for Wells. The federal worker said he voted for Gray in 2010 and was "disappointed not to be voting for him this time around.'' Teutsch said he believes Gray has "generally been a good mayor'' but is concerned that he has pledged to stay in office if indicted. "I think it would be bad for the city,'' Teutsch said. Five people involved with Gray's campaign four years ago have pleaded guilty to felonies. Three weeks ago, federal prosecutors said for the first time Gray knew about an illegal, $668,000 slush fund that helped him get elected in 2010.